Lots of people upload videos on Facebook daily but you can only play those videos if you have flash player installed, you're not allowed to download them. Sometimes, you probably wish to save some of these videos and watch later but there's no download option on Facebok. There are several ways to download Facebook videos which ranges from using different browser addons to different online services that allows you to freely download Facebook videos. Out of the different methods, I came up with five which I consider the best. There are lots of browser addons for downloading facebook videos but some of them are out of date. The most popular one last year which is Facebook Video no longer works but I ran a search on Firefox Addon site and came up with two addons which I personally tested out of the many I saw. After installing any or both of these addons, restart your browser, go to the video page and play. The addon icon is highlighted in blue and you can click on it to download the video. Both of them work in a similar manner. These addons also allow you to download videos from YouTube, Dailymotion, Google Videos, Facebook, Metacafe, MySpace Video, Break.com, Blip.tv, MyVideo.de, Spike, vimeo.com, YourFileHost, zippyvideos.com, yikers.com, revver.com, kontraband.com, badjojo.com, collegehumor.com, blastro.com, dachix.com, redtube.com and all the other popular of flash videos sites. DownFacebook is a website that allows you to download facebook videos freely by just writing the video url in the provided space. It automatically grabs the video gives the the download link. There's absolutely no need to download or install anything and it's perhaps the easiest way to get it done real fast. Facebook mobile users are presently not allowed to stream videos on facebook. Once you click on the video, whatcomes up is a download dialogue, at least, that's what i always see on my Opera Mini browser each time i try to watch a video on facebook. 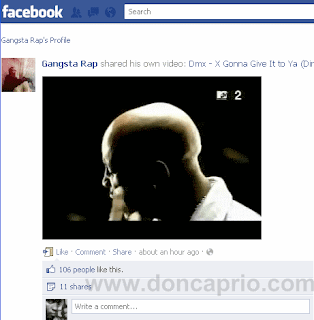 If you're on PC, just log on to m.facebook.com, facebook's mobile version, and visit the post containing the video. Clicking on it should download it unless you have a browser plugin like Quicktime Player that plays online MP4 videos. These are the easiest ways to download Facebook videos for now and I personally tried each of these on after the other. If you think this post is cool, sharing it on facebook isn't such a bad idea.